Sylvia Earle on Optimism and the Up and Down Sides of Fossil Fuels | "Global Possibilities"
Kip Evans Sylvia Earle in her element. I was listening to the deeply engaging radio program “On Being,” created and hosted by Krista Tippett, while driving to Bard College on Sunday to participate in a conference exploring paths to new economic norms. 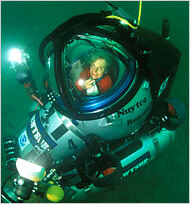 Tippett’s guest was Sylvia Earle, the underwater explorer, marine scientist and conservation campaigner. It’s well worth listening to (their entwined voices are a mellifluous duet of curiosity, passion and joy). But you can also read the conversation here. Dr. Earle: My mother used to come into my room and remind me that I should try to leave a place better than I found it. My father would watch me try to take things apart. It was my inclination to see how things worked. He reminded me that we should remember how to put things back together again when you take them apart. Try not to lose any of the pieces. I’ve taken that to heart over the years just looking at what we generally are doing to the planet. We don’t know how to put things back together again. We certainly are good at taking things apart and we have lost a lot of the pieces. This resonated; for me it was my maternal grandfather who conveyed these messages, and they stuck. This speaks of the importance of parental (and grandparental!) engagement with children, which probably plays a bigger role in shaping modes of living than anything someone learns in school or through the media. Dr. Earle: I think one of the reasons I am truly optimistic is that 50 years ago, even 20 years ago, we didn’t know. We did not have the capacity to see, to understand, what we now can see, can understand, about what we’re doing to the life-support system, the systems that keep us alive. Some people call this phenomenon the boundaries that hold the world together, if you will, and make a world hospitable for the likes of us. So now we know. It’s partly because, ironically, the burning of fossil fuels, coal, oil, gas, to give us the energy in a very short period of time, dense forms of energy that enable us to send rockets into space, that enable us to power submersibles into the sea, and instrumentation that gives us communication. Now we know because of this capacity to look at ourselves with new eyes, but it couldn’t happen had we been powering our civilization on whale oil or its predecessors. It’s only because of this amazing transformation made possible through the energy sources that now, it turns out, are coming back to haunt us…. But now we know, so we can use the power of knowledge. I mean, it’s all very straightforward, but it gets complicated when you think about the politics. That’s the problem. Ms. Tippett: …So I’m wondering how what you know — what are some of the most direct and basic forms for ordinary people to take this knowledge in and act on it? We’re told to eat fish now because it’s good for us. I understood that you don’t fish or you don’t each much fish. So tell me about that. How might we think differently about that simple eating habit? The first starts with knowing, but do you have a way with music? A way with numbers? Are you a lawyer? Do you have some insight into policy? Do you have any position in office? Are you a mom? Are you a teacher? Are you a dad? Are you a fisherman? A communicator? Use your power. Artists use their power. Jackson Browne has written a song that talks of, if you could be anywhere in time, it would be now. Why? Because this is the time. I don’t agree with all of Earle’s views. (For instance, she opposes sportfishing and consuming wild-caught fish altogether; I see fishing, for many — particularly kids — as a source of environmental engagement and, ultimately, care.) But we’re in total sync on most points, particularly in the value of focusing less on the “woe is me, shame on you” approach to pursuing environmental progress and more on building environmental understanding, engagement and the capacity to make a difference.